Our signature extra thick spaghetti dishes include “Neapolitan,” “Soy-sauce based Clam,” “Tomato and Japanese basil (Basil pesto),” and all of our dishes are dynamically seasoned. Our large volume spaghetti dishes offered at a reasonable price is our original concept based on both Japanese’s noodle culture and western food culture which is slightly different from Italian pasta. Signature menu! The original Neapolitan sauce perfects the delicious dish. Add the soft-boiled egg as a topping to enjoy a different taste. Clams and the soy-sauce will certainly sharpen your appetite. 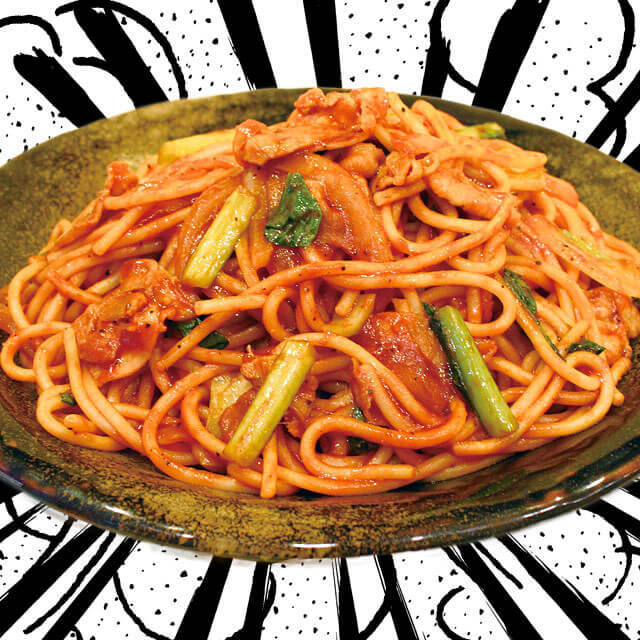 A simple spaghetti with tomato and Japanese basil. One of the most popular dishes! Excellent yet simple spicy cod roe spaghetti. Bokkake is a common household dish from Kobe, Japan. A very addictive and original menu of Romesapa Balboa. Please enjoy the richness of Carbonara sauce with crispy bacon which is surely addictive. Add the soft-boiled egg as a topping to enhance taste. Spicy curry sauce with minced meat goes extremely well with the thick noodles. Special meat sauce with plenty of minced meat that pairs perfectly well with the thick noodles. A menu that is simple yet loved by many people. Please note that prices for some menu items vary by location. Goes well with every menu item! If you want to make your spaghetti spicy, this is it! It surprisingly goes well with Neapolitan as well! Perfect for Tomato and Japanese basil and more! If you need energy this is the topping!